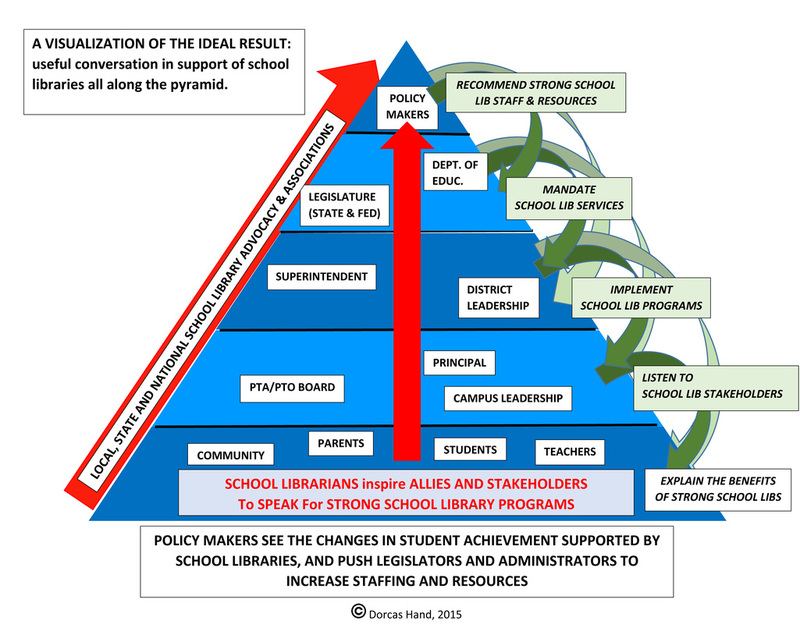 I realized recently that I needed an image to help me explain how I think about all the stakeholders - and this pyramid came to me. I hope you find it helpful as well. The YALSA blog offers this podcast, an interview of Dorcas about Advocacy for teens with reference to the YALSA Advocacy Benchmarks. The interview is from November, 2014, but the podcast wasn't posted until July, 2015. The benchmarks are a great resource for any interested library advocact, as they offer a rubric to help readers see how to step to stronger advocacy practices. The TASLTalks blog is a year old in October 2015. Managed by the TASL Legislative and Advocacy Committee, it offers TASL membership a range of ideas on school library advocacy in Texas and beyond. Many authors join their voices here to be sure Texas folks ave great options. In hopes of helping the Houston ISD School Board better understand why HISD schools need librarians in all the libraries, I have begun working with a group of local folks. We opened this website on 9/2/2013: Students need Libraries in HISD. Thanks to AASL for all the support documentation posted there. "The New School Library: The Human Connection to Digital Resources and Academic Success" by Elisabeth Abarbanel (Brentwood School, CA), Sarah Davis (Viewpoint School, CA), Dorcas Hand (AOS, TX), Matthew Wittmer (Buckley School, CA) in Independent School Magazine, May, 2013. "Making Progress by Fives" by Dorcas Hand in American Libraries Online, December 11, 2011. 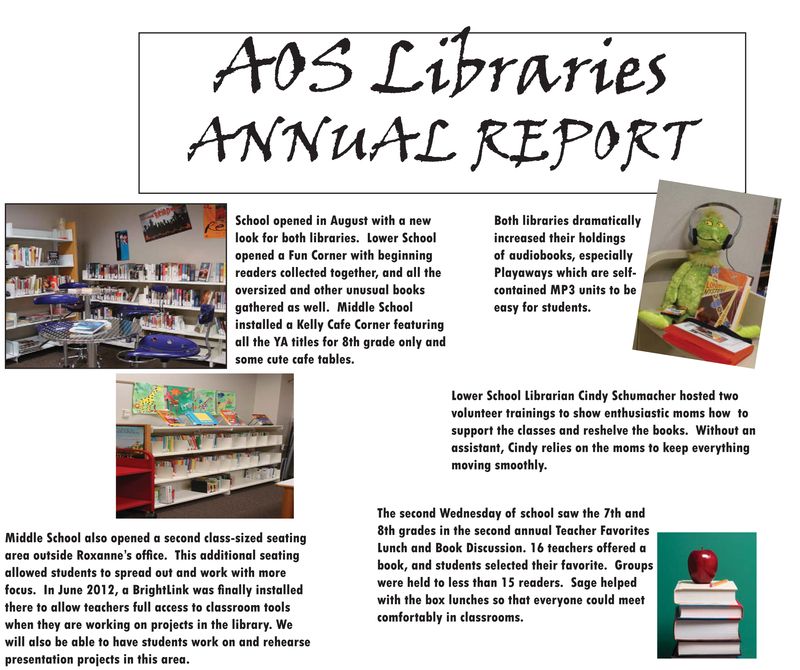 This is my Annual Report for AOS for 2011-2012.